Papa John's is offering a free large pizza with up to three toppings with any online order totaling $15 or more through the day of the Super Bowl, February 7, 2016 at participating locations. 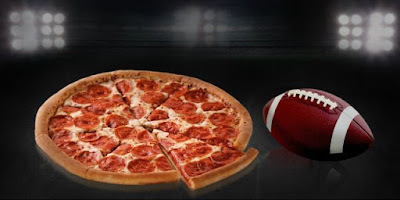 The catch is you won't be able to redeem the pizza until Monday, February 8, 2016 at the earliest. You'll also need to be enrolled in the rewards program as the pizza comes in the form of rewards points that must be redeemed by February 28, 2016 or they expire. To take advantage of the offer, you have to enter the code SUPERBOWL50. The free points can actually be redeemed for other items as well in case you don't feel like pizza (you get 25 bonus points). Other available items include Cinnamon Knots, Cheesesticks, and a giant chocolate chip cookie. They each go for 10 bonus points each so you can get any two of them. You can find more details regarding the deal on their website here.